I know it seems early, but we have an incredibly busy three weeks coming up, one of them which won't be condusive for any preparations at all, and then BAM!... it's Advent! I have been collecting books all year to mix into our selection of books from years past. I meant to keep a list of the ones we unwrapped and read each day during Advent last year, but I forgot. So, I thought I would record them here before I covered them up with our traditional purple paper. Below is a list of the books wrapped and ready to go. It's a tad incomplete because I started wrapping some before I wrote down the titles. Whoops! This year, I have enough books to go from the first Sunday of Advent all the way to the Epiphany on Jan. 2nd. Some books' theme correspond to a specific day and some are just old family favorites. The ones for Christmas and the octave following are wrapped in gold paper. So, what's in your Advent basket? I just ordered a bunch of dePaola books, but I might have to make another Amazon "run"! Love the wrapped books idea and your mantle last year was gorgeous!! Thanks for the inspiration. And I know what you mean: Advent is going to be here before we know it! SO exciting!! Thank you for this HUGE list! Advent and Lent are my two favorite seasons. I don't usually do book baskets, but I think I will. My little ones are getting too old, and if they don't read all these wonderful books, it will be too late! 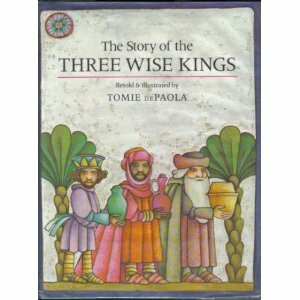 Oh, we'll have to get the three wise kings for Epiphany. 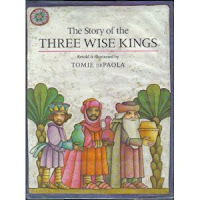 we shared our advent books a couple days ago here: http://lovemylittleflower.blogspot.com/2010/11/books-and-more-books.html. But we're adding more, and you have some wonderful suggestions. We love love love Jesus's Christmas Party. It is out of print, but absolutely adorable and fun to read. You have reminded me to go wrap my picture books in purple wrapping paper! And I will have to browse this post more leisurely very soon!